A Sacred Heart icon with bearded drag queen Conchita Wurst as a queer Christ has gone viral after the Austrian performer won the 2014 Eurovision Song Contest this weekend in Copenhagen. If Christ came back today, would s/he would appear as a genderqueer person singing an upbeat song like Conchita’s winning tune, “Rise Like a Phoenix”? Conchita is the alter ego of openly gay 25-year-old singer Thomas Neuwirth. He has spoken in favor of LGBT rights and told Reuters that Conchita's beard is "a statement to say that you can achieve anything, no matter who you are or how you look." You can enjoy the genderbending performance on video or download the song. 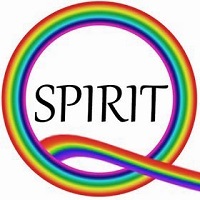 Thanks to Jayden Cameron of the Gay Mystic blog for the news tip. This is wrong at so many levels. I've always thought the guy laguhs at Jesus being his drag image. 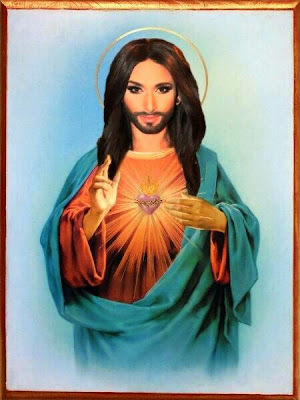 I'm not sure what Conchita's motivations are, but I like to share brand-new queer images of Christ from pop culture now and then to keep the discussion lively here at the Jesus in Love Blog.